After a long hiatus, I am finally getting back to my assessment project. The end of the third grade assessment is in sight! As I work to understand each standard and turn it into an assessment question, I do a fair amount of checking to make sure (1) I’m using appropriate levels of problems and (2) my assumptions are good. (I don’t always succeed, but that’s another story!) This check is particularly important with elementary topics because my credential and most of my experience is with secondary math. Okaaaay. Hmm. Well, the making-a-line-plot standard doesn’t have an image of a line plot. So, I did a little digging and discovered that, apparently, in the 3rd grade world a line plot looks like stacked X’s. Don’t get me wrong. I think the stacked-X’s-as-line-plot is an outstanding stepping stone between bar graphs or pictographs and traditional line plots. I understand it’s an important bridge, which will greatly help students make the transition. In fact, I hope teachers facilitate this transition by eventually asking students to draw a dot at the top of each stack of X’s and connect those dots with line segments. It’s just the name that gets me: line plot. When is a line not a line? When it’s a third grade line plot, of course. Anyone can see that. This entry was posted in Assessments, Learning, MTBoS on April 20, 2014 by galenaylor. Okay, this is becoming a little daunting. 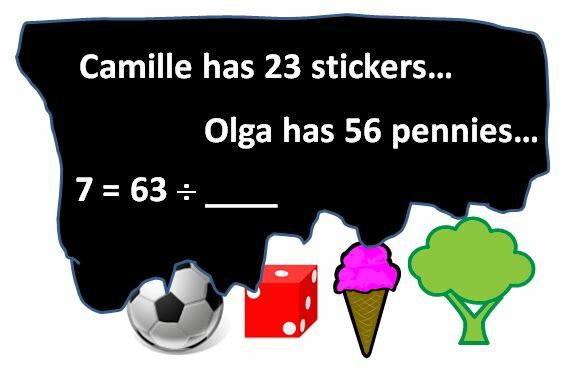 I knew the fun pictures of soccer balls and ice cream cones I used for the Kindergarten assessment were going to be replaced by more number-dense problems, but I’ve just finished the third grade Operations and Algebraic Thinking domain and I already have 29 problems. Yikes! My philosophy of including each word problem variation may not survive third grade. But how do I choose? Will it be the Goldilocks solution: one easy, one hard, and one “just right?” Or is there a better way? Oh, yes, and looking back at my notes from a month ago before I broke my foot (but that’s another story), I had already eliminated some of the word problem variations. Here’s what I wrote: “Naïve to think I could do them all… hard and easy array problems, array versus area problems, measurement versus non-measurement, [and] compare problems.” And that’s not even changing the location of the unknown in the problems, which makes a huge difference in complexity. I think I will continue to create the assessments as a complete mapping of the CCSS-M (including all word problem variations) because it is a way for me to more deeply understand the standards. However, it’s clear my original (and, apparently, naive) idea of creating a series of assessments that would illuminate concepts not mastered in previous math classes, and that would be practical to give students, is in need of some rethinking. This entry was posted in Assessments and tagged Common Core State Standards, Educational assessment, Math, Word problem (mathematics) on June 19, 2013 by galenaylor. You’ll immediately notice two things about the first grade assessments: They contain fewer pictures and MANY more word problems than the Kindergarten assessments. First grade does not include the Counting and Cardinality domain or as many other standards that require pictures, such as classifying by color and recognizing shapes. In the future, I might illustrate the word problems by including a picture of what the problem is about, e.g., use a picture of a toy car if the problem is about toy cars. But for now, since this is a draft, I will leave it as is. You may be wondering why there are so many more word problems. If you read my Kindergarten Word Problems post, you know the Common Core State Standards for Mathematics document contains a table that describes four categories of word problems. When you consider all cases and versions, there are 15 types of word problems listed. (This does not cover all types of word problems, just the basic ones of adding, subtracting, and comparing.) It seems to me a student cannot truly be proficient until she can solve every possible type of word problem; therefore, I have included 12 word problems in the first grade assessment. Twelve?!? Shouldn’t that be 15? Hmm…perhaps I got tired. I’ll have to fix that later. In any event, this is a huge increase in the number of word problems (from 2 to 12). As a result, I will most likely distribute them throughout the assessment before I use it. For each word problem. I included a description that maps directly to the table in the Common Core standards. 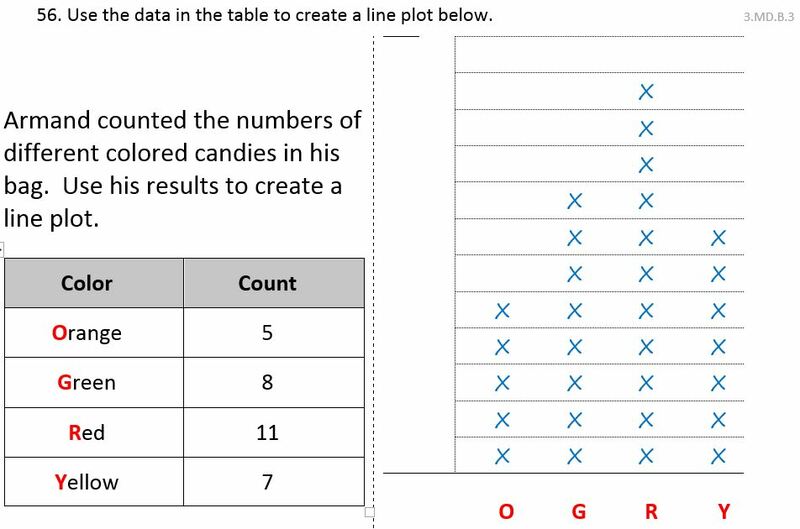 For example, question 12 is described as “word problems within 20, comparing, smaller unknown, ‘more’ .” If you are so inclined, you can use these descriptions to figure out which word problem types are not represented. What caught my eye in this article is this: When 145 sixth graders were given the problem 8 + 4 = ▢ + 5, none of them answered it correctly. The beginning of the solution – using the formula for the area of a triangle – is just fine. But multiplying the result by 6, while necessary to determine the area of the regular hexagon, makes the equation untrue. I think these students know the difference and they are just being careless. But … maybe not. Maybe they have fundamental misconceptions about equality. That’s one of the things I hope to find out when I give these assessments. This entry was posted in Assessments and tagged Common Core State Standards, Educational assessment, equality misconceptions, First grade, Kindergarten, Word problem (mathematics) on May 7, 2013 by galenaylor.